GH-DC series Dynamic mixing vacuum casting plant is mainly applied for 35KV and below epoxy resin casting of dry type transformer ,transformer ,reactor , high voltage switch insulator ,which can also meet the epoxy resin coating power and the vacuum casting of electronic components . 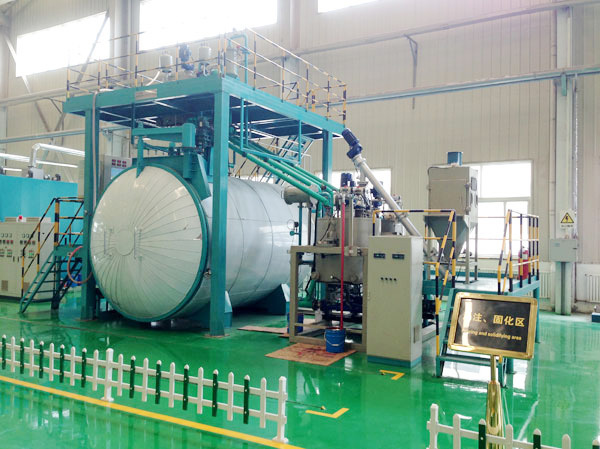 In the absence of air , through the different units of work ,dehydrating , degassing , heating to a certain temperature and mixing proportional for casting material ,Then casting it to the coil in the mould in the whole vacuum environment . The epoxy casting equipment product-ed is simple structure , convenient operation and easy maintain by our company ,which can also meet various technical requirements , including filler or without filler . The versatile unit design can be matched flexibly and can meet the requirements of upgrade in the future . 2. Material handling system: Improved film degassing and mixing technology, better and easier prolapse of moisture and air in the material. All chambers configured on the interface are standardized, not only interchangeable, but also to facilitate the future upgrading of equipment. 3. Material mixed metering system: According to the level of automation is divided into static and dynamic mixing two kinds of materials. 4. Vacuum system: The main vacuum pump group, vacuum filters, vacuum valves, pipes and other components. 6. Pneumatic system: Compressed air source, control valve, pressure detection system and other components for the vacuum, material valve control. 7. Cooling water system: Mainly used for cooling of some vacuum pumps and condensers. At present, our company has developed a casting plant that does not require cooling water. 8. Control system: For the control of the entire system operation, simple system without filler direct control by the relay. Programmed control by PLC-PC with metering or static mixing, according to process requirements, control of vacuum degree, temperature regulation and casting process, and the linkage protection and interlocking of each action to avoid human error. Have a detailed record of all operations, have been prepared to find. You can also set different operating rights to ensure the safety of plant and products. 10. Our company produced the small electronic components of the epoxy automatic potting equipment, high degree of automation, dose error of less than 5%, accurate mold positioning. Casting part of the configuration of 1-5 casting head, casting can be synchronized to achieve continuous flow-type production.